Say you’ve created an amazing white paper that’s jam-packed with important information for your audience. You know there’s some serious value there, but your readers just aren’t very engaged with the material. What do you do? Maybe it’s time to make your white paper interactive. What does that even mean? At a basic level, an interactive white paper is a dialogue, whereas static long-form content is a monologue. Adding interactivity takes your traditional content and transforms it into a two-way conversation. It begins with the existing white paper. Content from there is then condensed into the most important nuggets of information and paired up with an assessment, survey, calculator, or knowledge test. With the right tools, it can go way beyond the spectrum of a simple quiz and become an essential creative asset that drives new leads into your sales funnel on a regular basis. Here’s the gist: Rather than just acting as a megaphone saying, “Hey! Read my information!” an interactive white paper instead invites the reader to become an active participant in the education process. It really works, too. Just by adding interactive content to your marketing mix, you can dramatically improve prospect engagement—attaining as much as 50% click rates, 80% completion rates, and 40% lead form conversions. Why Do Interactive White Papers Work? The interactive version of a white paper is all about user value. That means that while there is still a moderate amount of reading required, the user is presented with a unique, custom result at the end of the experience. Not only do interactive white papers keep the reader interested, but they also tap into people’s natural desire to test their knowledge, share opinions, and benchmark themselves against their peers. They create an opportunity to build a human-to-human relationship rather than to purely educate. Really, it’s a win-win for both parties. The marketer gets to provide education and collect user data, and the user gets a fun, engaging experience with an interesting solution provided at the conclusion. 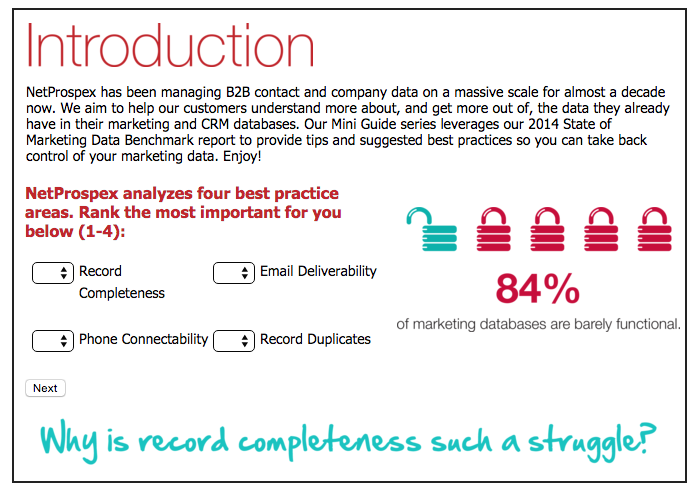 Here’s an example: NetProspex, a marketing data and contact management company, wanted to generate new leads with an interactive white paper. They used an existing piece of research about record completeness and offered it to users as an interactive white paper that asks survey questions throughout. Not only have they created a more engaging piece of content with serious value for the reader, but now they see how each prospect answered the questions and have a deeper understanding of their new leads. Why Are White Papers Valuable? We know that regular white papers are valuable. With beginnings as early as 1922 during Winston Churchill’s time, they’ve long been a trusted medium. Since the 1990s, they’ve been used in B2B application. The issue now is that there are so many white papers out there that each new one simply gets lost in the noise. They all begin to blend together. Think about it: The numbers paint a clear picture—everyone is using them. When everyone is doing something the same way—that’s the time when you should run in the other direction if you want to stand out. Enter the interactive white paper. The highly evolved sister of its original format, the interactive white paper allows users to step into the content and use it for their benefit. What Kind of Data do Marketers Get From Interactive White Papers? The value of an interactive white paper goes deeper still. Not only are marketers able to learn more about the way their audience would answer certain questions, but they can also use interactive white papers to develop rich profile data around participants, study read through rates, and more. Plus, when the user then reaches the lead form at the end of their interactive experience, they’re more engaged with the content (and therefore more apt to follow through.) In a way, you’re grabbing the user’s attention with the interactive content and then holding on to it until they’re right at the conversion point. Now think back to the regular white paper. It’s all right hook and no jabs. See why the reader would be less compelled to act? The conversation is one-sided and has provided little value—instead it’s just another piece of educational content to be glazed over. Maybe as a marketer, you’re tired of pushing the same old content that’s no longer producing results. The material within is still important—but it needs to be repackaged in a way that’s more interesting for the user. Interactivity is a route that has to be considered when talking about changing up the strategy. Learn more about interactive white papers in our interactive guide, What is Interactive Content & Why it Works.